Pennsylvania is known as the chocolate capital of the world, host to the best cheesesteak sandwiches in the country and home to arguably one of the best football teams in NFL history, the six time Superbowl champions “Pittsburgh Steelers”. From a music perspective, the estate is known as an indie alternative world, where Electronic Dance Music hardly shines bright but that has been changing in recent years, enter MitiS. MitiS, real name Joe Torre, is a classical trained pianist born and raised in Media, Pennsylvania, a borough from the Delaware County located 12 miles west of Philadelphia. Although his introduction to the music scene was through playing classical piano in respected halls such as Carnegie Hall in Manhattan NY, and the Kimmel Center in Philadelphia, it was Dance Music that has opened the most doors in his career as a musician. In 2011, at the young age of 20, he decided he wanted to give Electronic Dance Music a run for its money. After a string of free downloads, his remix of Metzo & Titanoz’s “Memories” landed on Beatport as his first official track available commercially. Since then he has taken the scene by storm with EP after EP, single after single and remix after remix, all becoming a bigger success than the one before. His latest EP “Living Color”, debuted in the iTunes top 10 (Dance, album) and in 2015 so far, his music has been streamed over 6 million times on Spotify and a massive 33+ million times on Youtube, numbers most DJs/Producers only dream of. The most impressive part of this? MitiS is only 24 years old and is only getting started. LABEL ENGINE: Thanks for taking the time to do this interview Joe, we have had the pleasure to see your career develop from day one and we became instant fans. Judging by the numbers we are not alone in embracing your music and talent, what do you think has been the biggest key to your early success? MITIS: Thanks so much for this opportunity, you guys have always been a great support system. I think the biggest key to my career so far has been my will to really show electronic music’s listeners it’s not always about something heavy, or not always about the “party” of the scene; it’s about the way the music makes you feel and think. LABEL ENGINE: Being born and raised in Pennsylvania, you didn’t exactly grow up in a estate known for having a big Dance music following. How were you introduced to Dance music and at what point did you know this is the career path you wanted to take, pushing classical music to the side? MITIS: Haha, that’s definitely true. I was that weird kid in school listening to “techno” with my skull candy headphones in 24/7, not giving a care in the world. It really started though when I went to 2011 Starscape Music Festival in Baltimore. I went and fell in love with the scene and community. Went right home and started figuring out how I could give it a shot and write my own creations. Everything started unfolding for me after that. LABEL ENGINE: It seemed like your career really took off after the release of “Born” EP, which was a dedication to the birth of your son. All artists have that career defining release, would you say “Born” was that defining release for you? MITIS: Definitely think so. I wrote born over night, and the next morning put it out for a Free Download. I didn’t think at all it was going to get the recognition it did, but I was blown away. That was when I decided to go down the path of writing more melodic music as to just tracks with drops. I enjoyed writing from my heart much more than focusing hours on “drops” and growls and such. LABEL ENGINE: Since the “Born EP”, you have released 4 other EPs but your latest, “Living Color” stands out because it seemed like you slightly shifted your style music wise. Most people might know you for your melodic dubstep songs but this time around you went into a more progressive trance style, was that shift made consciously? Were you getting tired of the similar formula? MITIS: Yes, it was very conscious. It wasn’t that I was tired, but I wanted to really showcase the styles of music I enjoy but with my own flare to it, ya know? I’m a huge Trance/progressive house fan and it may be my favorite to write. It also is more club-friendly and brings more diversity to my live shows which I felt I needed. LABEL ENGINE: “Living Color” was definitely a commercial success, debuting in the iTunes Dance top 10 so it is safe to say your fans love the versatility of your music. What gives you inspiration? What is your creative process like? MITIS: I was in Reading Terminal Market eating a Gyro in Philly when i saw it entered iTunes top 10 Dance chart and flipped! I’ll never forget that. Honestly everything and anything gives me inspiration. I get child-like excited going to festivals still, or even shows, so that always adds into the stream of inspiration. My creative process always starts out sitting at my piano at home and just doing some improv. I end up stumbling across a melody I like and hear it being a potential synth. After that it’s all into the synthesis and processing stages. LABEL ENGINE: You have been pretty steady with the release of EPs in a world led by singles but on July 16th you are releasing a single instead (Now available in stores). “Forever” is next in line on your label “Born Records”, is this indication that an album might be on its way? MITIS: Hah, ya never know (Although you’ll be the first to see it posted)! I have 12-20 unfinished but close to being finished tracks in my library right now that I’m not sure what to do with, but an album has been in my mind all along. Everything from deep house to melodic dubstep. I’m really excited to get these out there, I think it’s personally my best work yet. LABEL ENGINE: You founded Born Records last year and besides it being a viable way for you to release your own music, you have released music by MaHi and Kicks N Licks as well. What do you picture Born Records being like in the future? 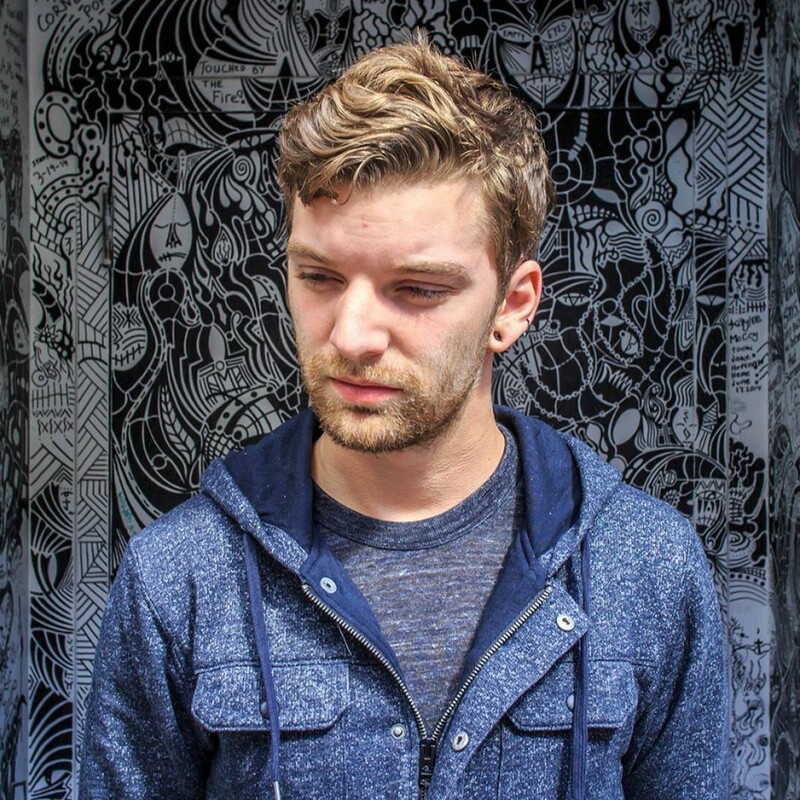 MITIS: Born Records is really special to me, and I think special to everyone involved. MaHi and KnL were with me when the whole planning stages were in the making and helped with a lot of ideas and have contributed tracks and support ever since. The plan here on out is really just finding certain artists and getting to know them and their music before releases, and also making the release the best I can for them. LABEL ENGINE: You have embarked in multiple headlining tours but I would think playing EDC this year is probably the highlight of your career as a DJ. What was it like sharing the stage with the likes of 12th Planet, Excision and Andy C? MITIS: Just being on an EDC line up to me is humbling, incredible, and overall unreal. I went last year as just an attendee and enjoyed myself beyond belief, and then when my agent called me and told me the news about this years, I flipped and could’t believe it. Definitely memories I’ll never forget. Unfortunately, this year there were heavy winds and some things going on out of my control that inhibited KnL and I to be on stage legally, so we didn’t get a chance to play. Our fans were amazing though. So many tweets of people who came out early and roughed through the heat waiting to be let in the gates. After we announced we couldn’t play, we set up a Meet & greet spot. A ton of people met us there and had drinks with us. It was a really amazing experience. LABEL ENGINE: What song(s) are you enjoying the most these days? MITIS: Dan Sieg wrote this track “Horizons” that I listen to almost daily. It’s heavenly. I listen to a lot of Above & Beyond, so basically anything from them. I also love Caspian. I think Caspian is probably one of my all time favorite bands to ever exist. Anything chill and feel good, I’ll listen to. LABEL ENGINE: First there was Fidget, then Moombahton and now “Future House”, what do you think is the “next big thing”? MITIS: Oh god, I have no idea. I don’t think I could even have a prediction. I’ve been saying Drum & bass, but I think it keeps getting stepped on by Deep, Trap, and genres like that. So i’ll stick to that, Drum & Bass. I hope, at least. LABEL ENGINE: What advise would you give up and coming producers that are thinking in giving Dance music a run for its money as well? MITIS: It’s often times lonely, but it’s a beautiful process of learning your creativity on a much more personal level. Don’t follow a trend, we have enough people doing that. Follow what you love and show it through your art and make THAT the trend . You’re given a platform called the internet where you can show millions of people what YOU made, what YOU poured your heart into. Never give up on yourself because in the end it’s all you have and you’re worth it. You’re worth someone’s time to listen to your art, regardless if it’s “Industry Standard”. Keep at it and “that’s good enough” should never be enough. Keep digging to find that tone, that sound, that feeling you know is there. LABEL ENGINE: Lets take a step back from the music talk, to the music world you are MitiS but to your family and friends you are simply Joe. What is a typical day in your shoes like? MITIS: A typical day always starts with a cup of coffee. I’m very mean if I don’t get one, so it’s better for everyone, lol. I go right to my computer and start listening to a track I was working on the day before and start working on it if I feel i can add properly to it. After hours fly by I’ll chill, watch a show, practice Djng, hang out with MaHi or some hometown homies. Usually very random. I always try and get what I need to get done before relaxing. That doesn’t always work out so well being a musician. LABEL ENGINE: The birth of your son has to be the highlight of your life, what is like to being a father and how has fatherhood changed you? MITIS: Man, a question like that even brings me chills. It’s wonderful, a lot of dedication, and incredibly inspiring. It’s made me know my life isn’t about me, it’s about someone else. He needs love, and needs care. He wears that and shows that, so it demonstrates to me what everyone needs but may not wear and may not show. It’s made me grow up and realize even more so the simple things that should make you happy. To not always focus on the things that are bringing us down, but the little things that can bring us up. For me thats him and music. He’s definitely showed me a lot about life already and he’s only 2. LABEL ENGINE: When you are not producing music or doing label work, what are some of the hobbies you enjoy taking part of? MITIS: I work on my car often, I find it relaxing and a fun outdoor activity. Going on walks through woods I do pretty frequently. Honestly that’s pretty much it. I don’t have a lot of time for a bunch of hobbies, but I love what I have. LABEL ENGINE: What is the best piece of advice you have ever received? MITIS: “The less you worry about the money, the more fun you’ll have living, and the more money will come in without you even realizing it.” – My Dad talking about how money shouldn’t run passion or careers.